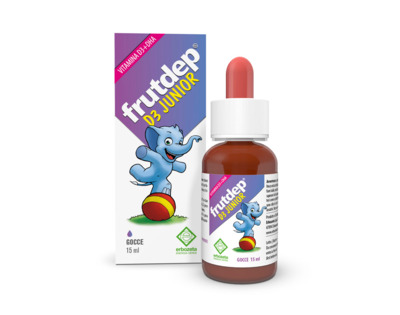 FRUTDEP® D3 JUNIOR is a food supplement based on Algal DHA and Vitamin D3 useful to provide a supplementation of these nutrients in the daily diet. Moreover, Vitamin D3 contributes to maintain healthy bones and normal muscle function, favour normal absorption and use of calcium and phosphorus and healthy functioning of the babies’ immune system. Take 0.5 ml of product a day, directly under your tongue, on a full stomach. 11 drops correspond to the 0.5 ml mark on the internal dropper.